You have decided to start an online business. You must have also explored the kind of products you are going to sell, and the markets that seem promising. Now, one of the first questions you may encounter would be about the right platform that you should use. There are several great options available when you take a look at a suitable eCommerce platform. You might literally be spoiled for choice when you try to pick one. In this article, we will provide some tips to help you choose the best eCommerce platform to set up your online store. You will also get an idea of some of the most popular eCommerce platforms and their features. How will you decide which is the best eCommerce platform for your store? There are several considerations in this regard that you need to pay attention to. We will point out some of these aspects here. There are several platforms available in the market to help you set up an eCommerce store. They all will have a standard set of features that will help you manage the basic requirements of the store. However, some of them will be more suitable to you depending on the type of products you sell. For example, your approach to business will be different depending on whether you are selling physical products like clothes, or digital products like software downloads. Having a clear idea on the type of products you sell will help you have a clear perspective early on. This is undoubtedly one of your major concerns when you look for an online platform for your store. The pricing patterns of various eCommerce platforms are often drastically different. A careful analysis of features and related pricing components to understand what is essential and what can be ignored. For example, at the starting stages a lot of small business owners would want to tread lightly. So, a lean and mean platform with minimal financial risks would be what they will be looking for. On the other hand, an enterprise level solution would be looking for maximum bells and whistles to capture the attention of the market. Both the above scenarios would require totally different approaches and depending on the nature of your business you have to take a call. Thankfully, you will find varied pricing options with most platforms covering diverse scope for businesses and individuals alike. An eCommerce venture is never a standalone entity with just the platform and products. You need to integrate a variety of third party tools and applications to handle different aspects of the store. For example, payment gateways, account management, shipping carriers, marketing initiatives, etc., require integration of third party tools. It is essential to understand the platform of your choice offers seamless integration with multiple tools in each domain. If the platform supports only a select bunch of tools, things could get pretty restricted to you when you are trying to grow your business rapidly. Compare multiple platforms to understand if you can easily integrate third party tools without hassles when you need them. Mobile shopping is growing at a rapid pace. So, it is critical that the eCommerce platform you choose offers mobile support without hiccups. A good eCommerce platform will ensure that your customer finds the same, seamless user experience on your store irrespective of the device they are signing in from. With multiple options available, same user would sometimes use different devices to shop from your site. If they are able to checkout from your store with no noticeable differences, you can consider your platform and tools responsive. Regular testing and a keen monitoring of customer behavior will give you insights if there are flaws in any of the aspects of the store. When you have an online store, you will have the responsibility of your customers’ data as well. Hence the platform should provide foolproof security to your products and data. Make sure that the platform takes security seriously. Customers would naturally hesitate to provide their transaction details if your site appears to be less secure. So, you have to ensure your platform to be secure for the successful establishment of your business. Make sure that the platform of your choice is PCI compliant and supports HTTPS for secure transactions. Here is a more detailed look at some of the popular eCommerce platforms you can get for your channels. WooCommerce is one of the most customizable eCommerce platforms currently available in the digital space. If you have a self hosting WordPress site, you can install WooCommerce free of cost. According to statistics, more than 28% of all online stores across the world are powered by WooCommerce. As a store owner, you can configure your store according to your specific needs effortlessly. Compared to hosted platforms, WooCommerce offers the store owner complete control of their data. By default, WooCommerce is a lean and mean tool with no superfluous features. However, with the help of the numerous extensions available, you can incorporate any functionality that you can imagine. You can find a large number of extensions for WooCommerce at their official extensions store, ELEXtensions, PluginHive, YITH, etc. One of the main advantages of using WooCommerce is that it is a flexible platform to sell any kind of products. You can sell physical, or digital products and even virtual products like services. With the help of extensions, you can also sell tickets, bookings and subscriptions as well through WooCommerce. WooCommerce comes with a bunch of basic payment options including PayPal. You can easily add other payment gateways of your choice through extensions. Similarly, you can find basic options for shipping also which you can extend with the help of plugins. The code of WooCommerce is audited by industry experts and as a result you can be assured of the safety of your site and data. Complete control of your data. Flexibility to sell any kind of products. Large availability of themes and plugins. Storefront is a great option for theme as it is free and offers seamless integration. Geolocate to determine the location of your customer. This will help to provide shipping and tax estimates more easily. Support from the dedicated team of WooCommerce as well as a global community of WordPress users and developers. This will enable you to find a suitable solution for a large number of business problems you may encounter. Great support for a variety of integrations. You can get third party options for payment, shipping, marketing, accounting, inventory, and a lot more. If you are not keen on getting your own hosting and domain name, you can consider Shopify. Everything you need to set up an online store will be taken care of right from hosting to creating your brand identity. When you start out, Shopify will help you choose a name and logo for your business. You will also be able to get a domain name and you can start selling soon using the powerful features of Shopify. Shopify has reasonable and transparent pricing suitable for varied budgets. Multichannel retail is a breeze when you are using Shopify. On this platform, you can choose to sell anywhere you can find customers. Be it on an eCommerce store, point of sale location, marketplace or even social media, Shopify has a solution to help you sell. It even offers an option to incorporate a ‘Buy Button’ to a blog or normal website as well. 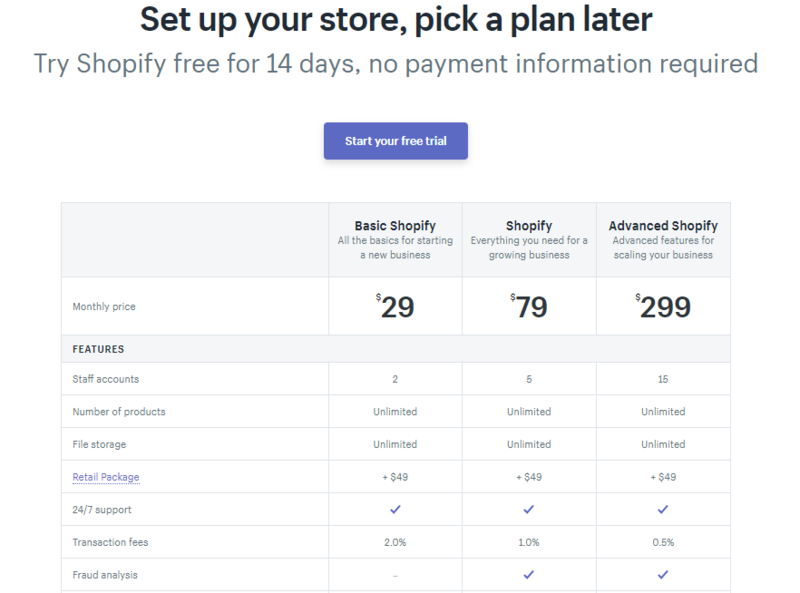 Managing varied aspects of your store is effortless too with Shopify. It offers centralized inventory and smooth options for fulfillment. Without any additional setup, you can actually accept payment through credit card as well as other local payment methods. In addition, you can integrate a variety of third party applications as well. If you prefer to manage your store through a mobile phone, the mobile app will help you manage that. Moreover, Shopify offers comprehensive options to help with your marketing efforts as well. It will help you find the right audience for your store with content marketing and SEO tools. You can create campaigns like Google Shopping from your Shopify admin and even automate the marketing initiatives as well. With great reporting features, you will be able to constantly gain actionable insights and improve your campaigns as well. Magento is another hugely popular eCommerce solution that will suit businesses of all sizes. It offers great flexibility to help you build a business the way you envision it. Magento too, is flexible to provide a great experience to customers, be it on a store, mobile or at a physical retail location. As it is part of the Adobe cloud platform, you can manage your store, content, analytics and advertising all in one place. Automated order management system will reduce manual work and costs considerably for your with Magento. Magento marketplace offers a large number of extensions catering to varied functionalities. Getting a new web store up and running will be quite fast with Magento. If yours is a budding small business, you can get the support of Magento solution partners to design and implement your site quickly. Another advantage is that Magento helps you sell on marketplaces like Amazon and eBay quite smoothly as well. It makes acquiring new customers and markets relatively easy with a range of integrated tools. Getting themes and extensions are easy to with Magento marketplace. Here is a look at some of the features of Magento that might prove to be significant. Create a great customer experience with powerful content creation tools, and a simple drag and drop page builder. Even with minimal technical knowledge, you will be able to craft a world class experience for your customers. Simple user interface to easily manage the various aspects of your web store. Explore personalization options to provide custom content, pricing, and deals for your ccustomers. Options to easily preview updates on your site without major help from your technical team. Features like “Instant Purchase” to help users checkout smoothly from your site. Easy and powerful options to dynamically link your products to promote up selling and cross selling. Automation rules to assign products to a specific category as well as ‘Elasticsearch’ option to improve search relevance and better chances of conversion. 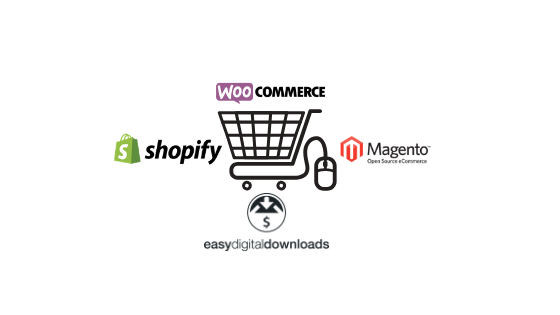 If you have a WordPress site and you want to sell only digital products on your store, Easy Digital Downloads can be a great option. From music files to software, you can sell your digital product efficiently with the help of Easy Digital Downloads. Out of the box, you will find a large number of useful features on this platform. And, for additional features, you can find over 100 extensions with different functionalities. Being an open source platform, you will find a large community of users and developers for Easy Digital Downloads as well. Let’s see some of the top features of this platform. Multiple purchases in one go – With the integrated shopping cart system, your customers will be able to make multiple downloads at once. The checkout experience is swift and seamless. Control over downloads – How many downloads you allow for each customer can be a challenge when you sell digital products. Easy Digital Downloads offers complete control for shop owners to manage this. Monitor downloads – You can monitor customer activity around all your files. Easy Digital Downloads allows you to track IP address, time, etc., of customers accessing files. Offer deals easily – You can set up various discounts on the store easily. Options are available to set up flat rate or percentage discounts. Customer account – Registered customers will be able to see relevant information like purchase history. Reporting options – It offers a good reporting system by default to view relevant metrics of your site. Extension pass – You can opt for a pricing plan which will give you access to extension bundles. There are also options to purchase extensions individually. How to start an online store from scratch? Previous articleHow To Reduce Bounce Rate On Your WordPress Site? Next articleHow Does WooCommerce Integrate Commerce with Content Seamlessly? I agree with most of the points, Sujith. Also, Ecommerce platforms also should be chosen by keeping future plans in mind as well. Because when you know that you are going to expand your business going forward, then you need a platforms that can be easily modified to meet the requirements.